Here's a superb online video slots game from Eyecon gaming that you can play. Show me the money, bunny! This is one cute online slot, full of fluffy bunnies to help you hop your way through the reels. Don’t be fooled by the cuteness though the gameplay and big prizes are for winners, fluffy or not. Make sure to know more about the game for better chances of winning in this casino games. Here goes fluffy bunny fans, time to enter an adorable world of colour, never-ending cuteness and hidden fluffy rewards with Money Bunny. If you love rabbits you’ll go hopping mad for this 3 reel, 9 payline classic slot. The aim of the game is to try get 3 or more of the same symbol on an activate paylines – that’s when you’ll trigger a cash prize. To get started choose a wager and your paylines then get those reels spinning. Strike it lucky and you can play an optional mini game and gamble your prize in a double or nothing challenge. Your stake is your choice, but remember the bigger your stake, the larger your potential rewards. If you want fast play use the autospin mode to place the same bet over several spins in a row. 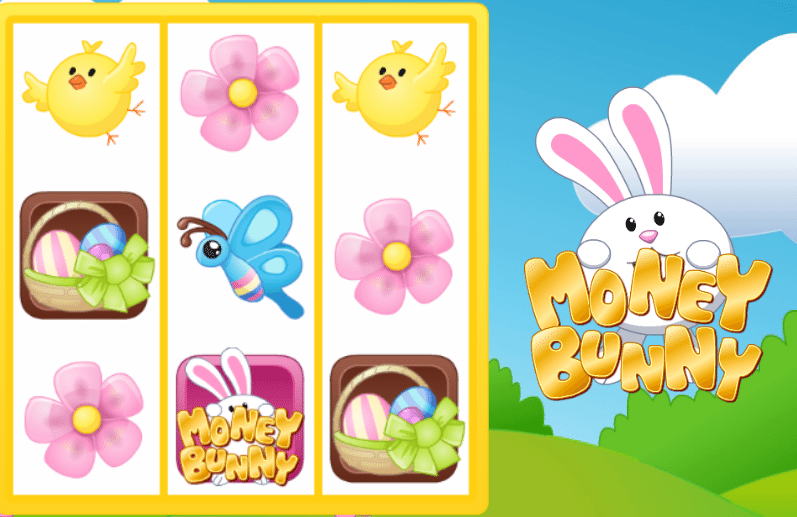 Money Bunny has lots of cute reel symbols to keep you entertained and lining 3 of these up will bring you prizes. The butterfly and the carrot are the most common and will bring you a max of 10 credits. Slightly rarer but more valuable are the bird, chocolate rabbit and Easter eggs and these can be worth up to 300 credits. Money Bunny game logo: The Money Bunny game logo acts as the Wild and you can use it to replace any of the symbols above to generate winning combination - wild combinations alone are worth 1000 credits. Scatter rabbit: The scatter rabbit is a magical little symbol that triggers a big bonus. It’s pretty simple, all you need to do is find 3 of them anywhere on the screen to win 8 free game. Best of all during those games all your fluffy payouts are instantly tripled. Easter basket: Sticking with the bunny theme, the Easter basket is another scatter but instead of free games it generates a pick-and-win mini game. Choose your symbols in this game wisely - they can be worth up to 111x your starting stake. That’s a multiplier that can make a huge difference to your final pay pot. Don’t fancy a cute, colourful and fun world of rabbit loveliness? 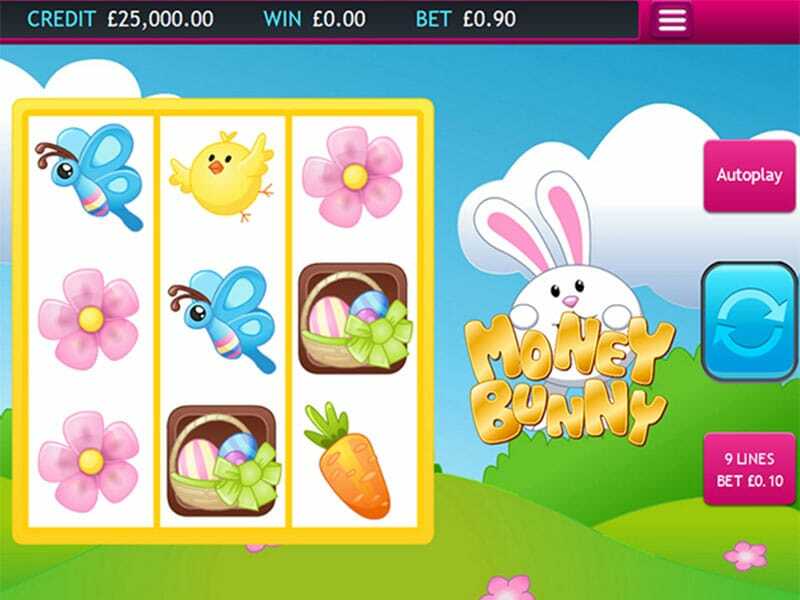 You’re hopping mad, this online slot complete with chocolate eggs, fluffy bunnies and tasty prizes is a real winner. Classic slot gameplay, excellent graphics and the generous free spins, scatters and bonus mini-games make this a real bunny bonanza. Go on, give it a spin, you might hit the jackpot. If you enjoyed Money Bunny then you might also like Legend of the Golden Monkey.